You can insert pictures, photos, clip art, or other images to your slide show from your computer or from the Internet. You can add single or multiple images onto a slide, the slide master, or to the background. Click where you want to insert the picture on the slide. On the Insert tab, in the Images group, click Pictures. In the dialog box that opens, browse to the picture that you want to insert, click that picture, and then click Insert. Tip: If you want to insert multiple pictures at the same time, press and hold the Ctrl key while you select all the pictures you want to insert. On the Insert tab, in the Images group, click Online Pictures. (PowerPoint 2013) In the Bing Image Search box, type what you are searching for, and press Enter. (Newer versions) Ensure Bing is showing on the left in the drop-down list of sources to search. In the box, type what you are searching for, and press Enter. Use the Size, Type, Color, Layout, and licensing filters to adjust the results according to your preferences. Click the picture you want to insert, and click Insert. Tip: After you insert a picture, you can change its size and position. To do so, right-click the picture, and click Format Picture. You can then use the Format Picture tools that are on the right of your slide. Unlike some earlier versions of PowerPoint, PowerPoint 2013 and newer versions don't have a clip art gallery. Instead, use Insert > Online Pictures to find and insert clip art using the Bing search tool. 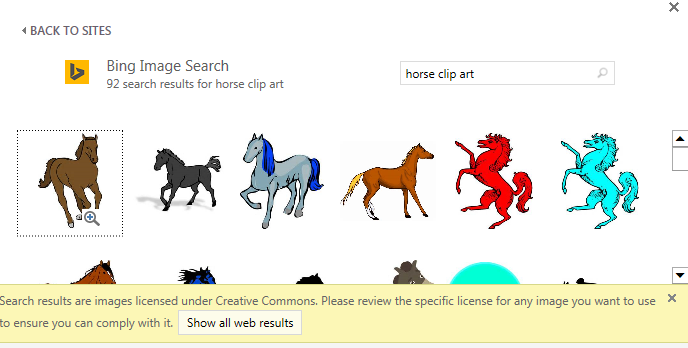 For example, after you select Online Pictures, you might search for horse clip art and see a variety of images under a Creative Commons license. Important: You are responsible for respecting copyright law, and the license filter in Bing can help you choose which images to use. Learn more at Add clip art to your file. If you want a picture to appear on every slide of a specific type in your PowerPoint template, add it to the slide master. To learn more, see What is a slide master? If you want a picture to appear as background without affecting all slides in a Master, change the background settings for the slide. Learn more at Add a picture as a slide background. You can add one or more images to a slide. Open the slide you want to insert a picture on. On the Insert menu, point at Picture, and then select Picture From File. In the dialog box that opens, browse to the picture that you want to insert, select that picture, and then click Insert. To insert multiple pictures at the same time, press and hold the Shift key while you select all the pictures you want to insert. The Photo Browser in Office helps you browse through existing photo sets on your computer, such as photos that you have in iPhoto or Photo Booth. On the Insert menu, point at Picture, and then select Photo Browser. In the dialog box that opens, browse to the picture that you want to insert, select that picture, and then drag it onto slide. To insert multiple pictures at the same time, press and hold the Shift key while you select all the pictures you want. Then drag them onto the slide. On the Insert menu, point at Photo, and then select Photo Browser. On the Insert menu, point at Clip Art, and then select Clip Art Browser. After you insert a picture, you can change its size and position. To do so, right-click the picture, and click Format Picture. You can then use the Format Picture tools that are on the right of your slide. You can drag a picture from File Explorer (in Windows) or Finder (on macOS) and drop it onto a slide. The picture will be centered on the slide. Then you can move, resize, or style the picture as you like. Office 365 business subscribers can insert pictures stored on OneDrive for Business or SharePoint Online. 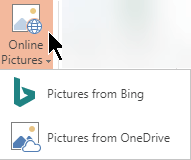 On the Insert tab, select Online Pictures > Pictures from OneDrive. On the Insert tab, select Online Pictures > Pictures from Bing. In the Search box at the top, type what you are searching for, and then press Enter. After the search results are shown, you may use the Size, Type, Color, Layout, and licensing filters to adjust the results according to your preferences. Click to select the picture you want, and then click Insert. When you insert a picture, PowerPoint Online places the picture on your slide and puts a Format tab on the ribbon. With the picture selected, click the Format tab. Choose the Picture Styles options that you want to apply to the picture. Click the down arrow at the right end of the gallery, as illustrated above, to see the complete gallery of style options. See Change the background of your slides. Open the slide you want to put the picture on. On the floating ribbon, switch to Insert. Your device's camera is turned on. If your presentation is horizontal, try turning your device sideways to take the picture. If you're satisfied, tap the check mark. To discard the picture and try again, tap the arrow. Use the crop or zoom tool to adjust the picture if you like. Tap the check mark to insert the picture on the slide. Use the tools across the top of the window navigate to where the picture's stored. Tap a picture to select and open it.